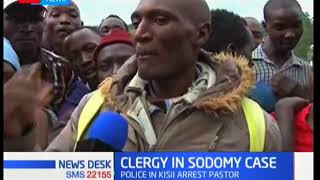 Police in Kisii have arrested a Pastor for allegedly sodomizing a 12 years old boy staying at his home repeatedly for the last six months. Pastor Samuel Okioma of Jesus Is Here Church was nabbed in his home after the woman reported the matter to Ogembo police station. Gucha OCPD Joseph Ireri said that the boy and the pastor have undergone medical tests at the Gucha Level Four Hospital with the pastor being held at the Ogembo Police Station cells awaiting the court appearance today.